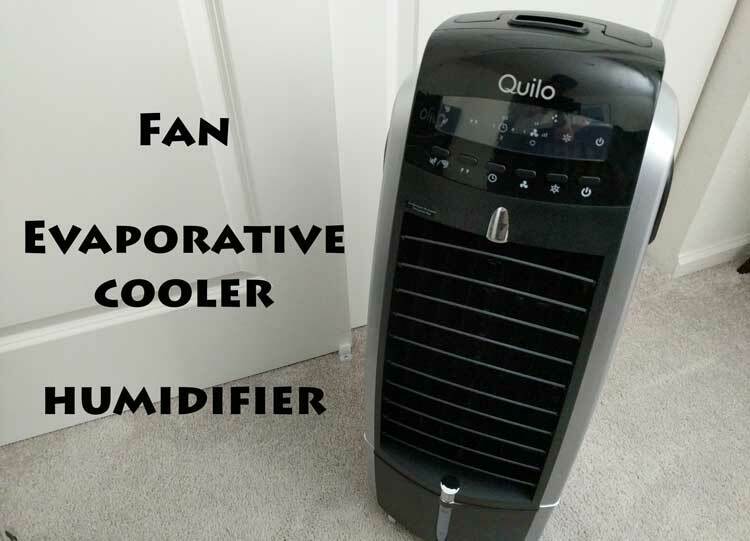 Disclosure: This post is provided by Quilo, who furnished me with a Quilo Fan with Evaporative Cooler and Humidifier to review. It’s hot. Really stupid hot. Today is a high of 95 degrees. It’s only 12:50pm and it is already 94 degrees. It’s days and nights like these that I am so thankful for air conditioning! However, as appreciative of air conditioning as I am, it is expensive! To cool the whole house is not very economical (especially our upstairs that is full of large sunny windows). We have been looking for an alternative cooling system for our upstairs bedroom. Even if we blast the air conditioning, the upstairs stays about 10 degrees hotter. It is very inefficient. My husband and I both don’t sleep well when it is too hot. 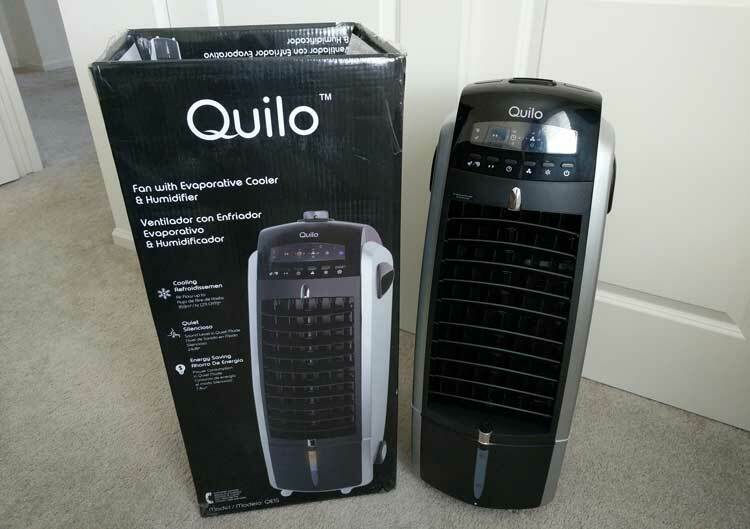 So looking at a few solutions, we found the Quilo Fan with Evaporative Cooler. Evaporative coolers are a energy efficient and productive way to keep energy costs low. Basically the warm air is drawn into the cooler, water gets pumped from the water tank and the water absorbs the heat. 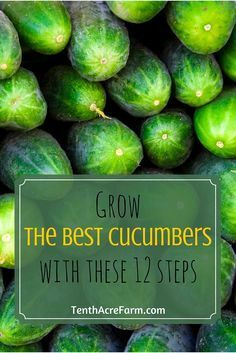 This process naturally cools and humidifies the air. Then the fan propels the newly cooled air into the room. There is no compressor system so the air cools naturally, efficiently and inexpensively. Fan – Circulates and ventilates room air. 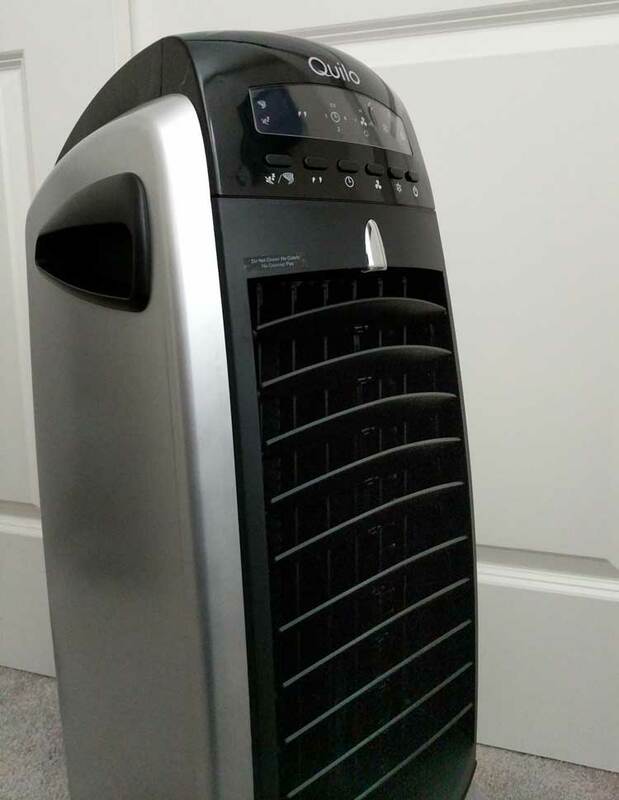 Evaporative Cooler – Transforms warm, dry air into moist, cool air..
Humidifier – Helps release moisture to relive dry air caused by heating and cool air. There is a water basin at the bottom of the Quilo. Fill this up with filtered water or pour the water through the Quilo filter. The Quilo can be operated with the push buttons or the remote controller. It is most efficient when it is placed in front of an open door of window. The cross ventilation means it can pull in and circulate air. Then turn the Quilo on. It can be used as cool or fan only on 4 different levels. There are many operating functions on the unit. Power – Turns the unit on/off. Cool – Uses the water tank to pump water through the honeycomb cooling media. Speed – Fan speeds low, medium, high and auto (wind speed gradually decreases and increases between turbo and quiet). Quiet/Turbo -Quiet minimizes wind speed for lower airflow. Turbo blasts wind at higher speeds for stronger airflow. Timer – Allows you to program the unit for up to 7/5 hours of use. Swing – Ventilation louver movement move left to right automatically. I have been using the Quilo for about 3 months. It has become a staple in our nightly routine. I love the quiet hum of it. It is peaceful and relaxing. We have it positioned up on a table by our open window. It does a nice job of keeping the air flowing in the room and cooling the air. I will say, it does guzzle the water though. I have to fill it up every night! I had no idea the water rotated this much! I put about a pitcher in it every night. Another thing we noticed was when the window is open and there is a lot of dust and pollen in the air, we found the water gets gross quickly. We are happy the water gets filtered before going into the air – but prefer to not have the window open with this unit. Since it does need air circulation, we put it by our bedroom door. That way it circulates the hallway air. I am happy to report the water filter looks good still (after using for over 3 months nightly). I will probably not clean it until the end of the summer. Which makes me happy – I didn’t want to have to constantly upkeep! There are great directions on how to do this in the users manual. Seems pretty easy too. Overall, I like the style of the unit, the white noise it provides and the cooling effect. It is not quite the blast of cool you get from air conditioning, but it does keep it cooler at night than just a box fan. We have been sleeping better with this evaporative cooler than just a fan alone. I would recommend it for an economical option for room cooling! We just got our very first evaporative cooler a few months ago and it has made all the difference! We live in PHX so it makes a huge impact on our house! This one looks nice! It will be nice if it has also built-in purifier so it can be one appliance for homes especially with children. I like that there are four different levels. This sounds like a great product. We have been shopping for an air purifier for a while. I think this would be a smart purchase for a family like us, that includes two cats. 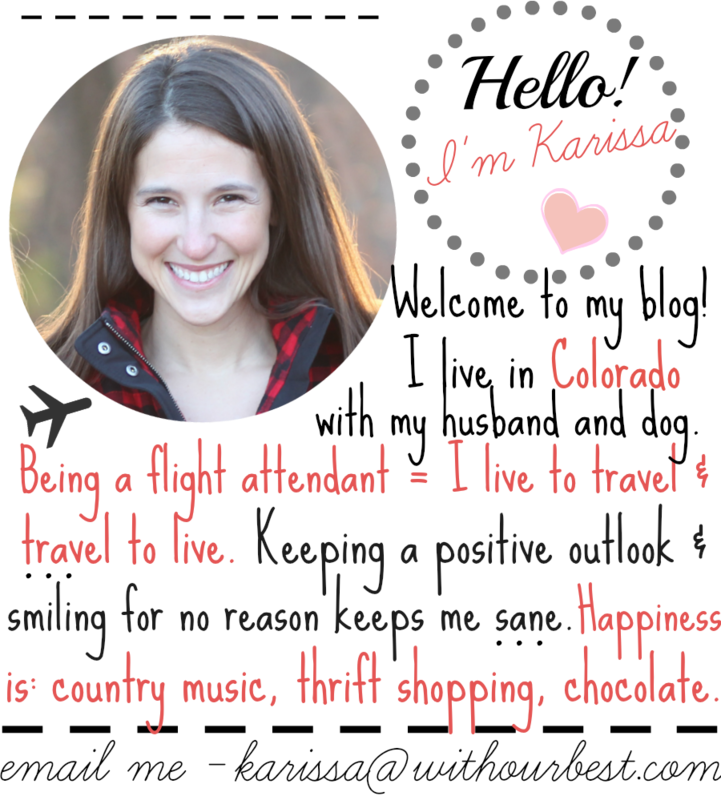 This is so interesting – we do have a couple of similar fans – but this seems so much more updated! The hottest it gets is for about 1 week or so a humid 85 Degrees in July – that’s once in a while and we pull out the fans – this is a great one it seems! Wow this looks fabulous. We could really use something like this in our basement! It looks like a really great one! Given the recent weather changes, this is something I badly need. Thanks for making a thorough review of it! This is so cool! I totally need this! We used to have a fan like that when my husband and I were newly married, It worked o cool us down when we’re sleeping during noon.